Any time I come across a recipe for something I grew up baking with my mom, I’m filled with warm fuzzies and food cravings. Lots of no-bake cookies and “strike-it-rich” cakes comes to mind. Imagine my delight then, when I bought this Guittard Chocolate Cookbook. 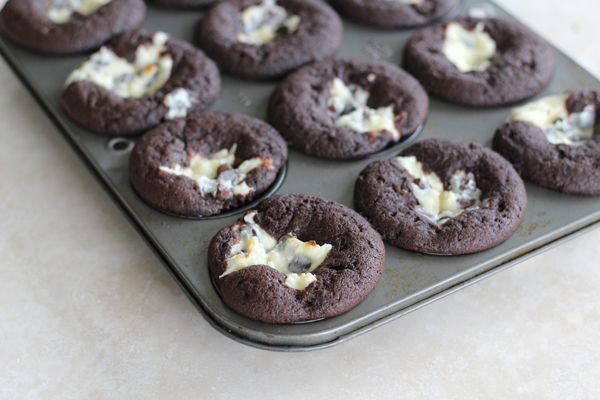 I was blasted to the past with these “Black Bottom Cupcakes.” They were a go-to treat in my family, bigtime. I was thrilled to make them again after all these years. This “cake-meets-cheesecake” dessert is so absolutely fabulous. I couldn’t even wait until they fully cooled to dig into one. It is definitely a winning recipe! 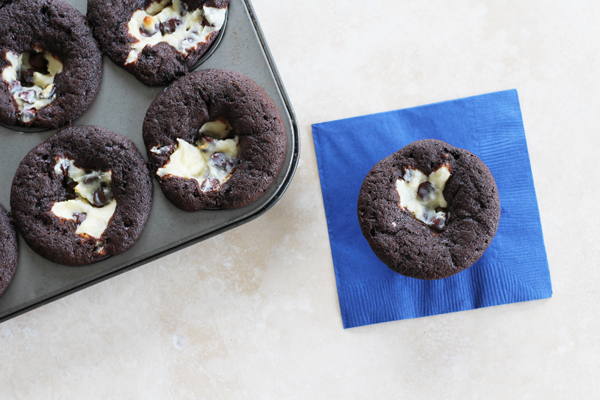 Warm, melted chocolate chips inside a tangy cream cheese filling, all surrounded by a rich and tender chocolate cupcake. There’s something about this ingredient combination that is marvelous. 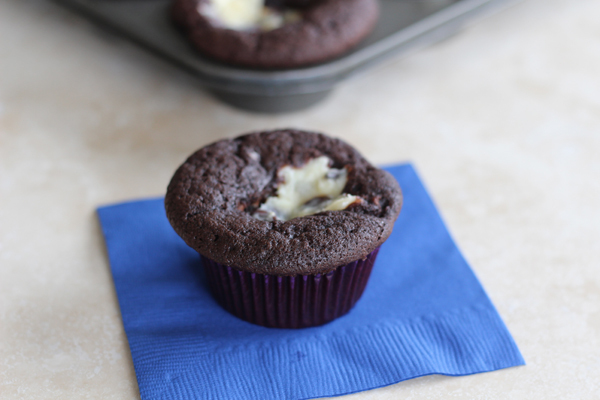 As a bonus, these cupcakes are incredibly easy to make! 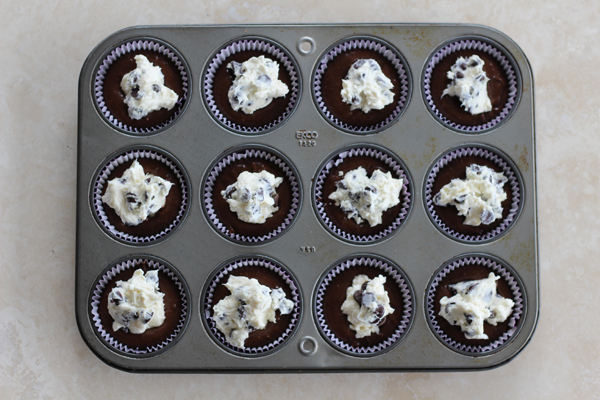 Once you prep the batter, divvy it up in a lined cupcake tin. Whip up the cream cheese filling. Add that on top of the chocolate batter. 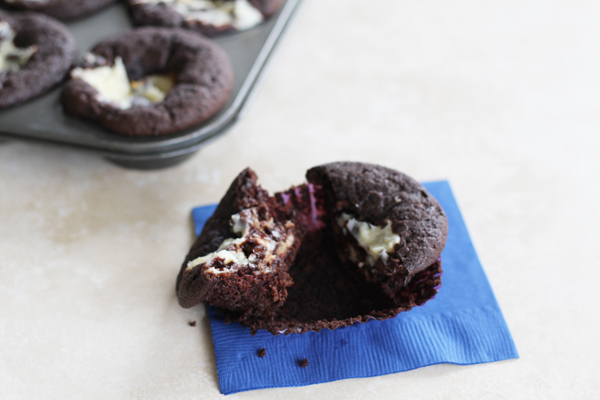 After about 20 minutes in the oven, you get your Black Bottom Cupcakes. Thank you Guittard for taking me and my taste buds back in time. This one is blue ribbon worthy for sure! Their recipe was my inspiration, but I changed a few things. I used coconut oil instead of vegetable oil, and added almond extract. I also upped all the amounts of cocoa, cream cheese, and chocolate chips. Coffee creamer came in handy when I didn’t have whole milk. Plus I made a few other minor tweaks. Black Bottom Cupcakes is a forgiving (translate: very easy) recipe, so it is a fun one to make with kids. Grab your ingredients and get baking! p.s. 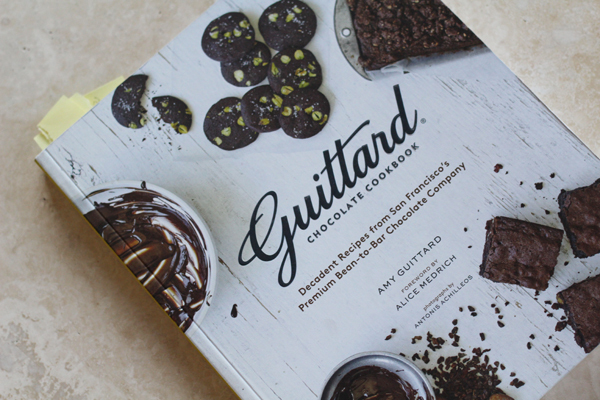 The Guittard Chocolate Cookbook is filled with fabulous recipes. I give it a thumbs up and hope you buy it. Here’s a link. Preheat oven to 350 degrees F. In large bowl, combine the dry ingredients (flour, sugar, cocoa, baking soda and salt). Add the warm water, coconut oil and extracts. Mix batter until blended and smooth. 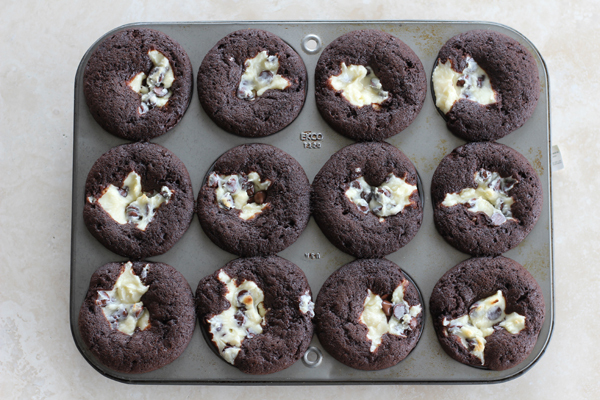 Line a 12 cup muffin/cupcake pan with liners (or use a silicone version). Divide the batter evenly among the 12 cups. Prep the filling: in a medium bowl, combine the cream cheese, sugar, and coffee cream. Whip until blended, then mix in chocolate chips. Drop filling into center of cupcakes, dividing it evenly among the 12 cups. Bake at 20 minutes or until center is set. (Hint: cupcake will expand over liners some while baking so cool almost completely before loosening around each cupcake and removing from pan). Refrigerate any leftovers. These make a good size cupcake. 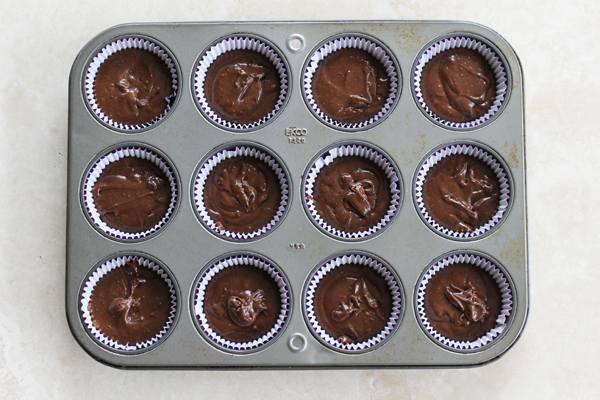 If you want them a classic, smaller size, use a second cupcake pan and fill about 18 cups, each just over half way full. Makes 12-18 cupcakes.